Batman: The Dark Knight Returns Cowl | Nerd Much? Frank Miller’s The Dark Knight Returns comic is highly regarded as one of the best Batman stories ever told. And Miller’s penciling, in conjunction with Lynn Varley’s colors, has stood the test of time to remain one of the most iconic looks for the Caped Crusader. 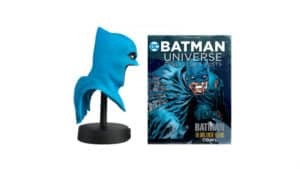 So if you’re a true Batman fan that loves some Batman merch, you’ve got to take a look at the Batman: The Dark Knight Returns Cowl that the Warner Bros. shop is now offering. The Batman: The Dark Knight Returns Cowl is impressively detailed. The blue hue used is a spot-on replication of the tone used in the comic. And the cowl’s facial features emit the same worn and tired hints that the character does in the classic comic as well. The Warner Bros. Batman: The Dark Knight Returns Cowl comes atop a clean black stand that sports a subtle DC logo. So you can position the memorabilia wherever you want the Dark Knight to be permanently brooding. 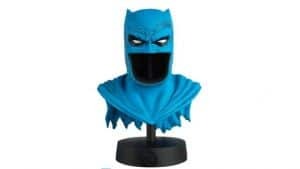 The Batman: The Dark Knight Returns Cowl is actually the second in this new Warner Bros. line of collector’s busts. The first of which centered on the sleek all black cowl used for the character within the newer DC Comics’ Rebirth era. That cowl is expected to begin shipping towards the end of March. Just like the Rebirth cowl, The Batman: The Dark Knight Returns Cowl isn’t available yet. But the Warner Bros. shop is taking preorders for the product which is expected to begin rolling out for U.S. and Canadian customers at the end of April. 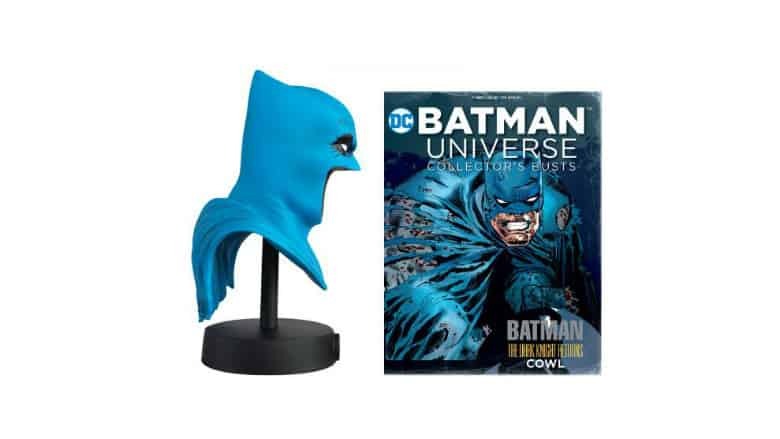 The cost of The Batman: The Dark Knight Returns Cowl is $44.95 before shipping costs are calculated. However, the Warner Bros. shop does offer free shipping for orders over $100. So if you planned on getting both cowls, another small item thrown into your cart should top you over into free shipping territory. Some people like fine art to line their walls. Others, sports memorabilia or family mementos. But if you’re a true Batman fan, these cowls are the only way to go. You can check out more cool Batman stuff here.